Horseshoe: We discussed their ideas. One group suggested having cookie selling rules taped on balls and they have to find the balls and put them in the right bucket. I think this can be adapted to a relay race for the girls. Glove Creatures: We found some fun ways to create creatures for the girls to sew, but not too much sewing! For the cat wearing a sweater, you cut off the middle finger (save it to make a tail) and then sew up the hole it leaves. The thumb is one arm and the little finger is the other. 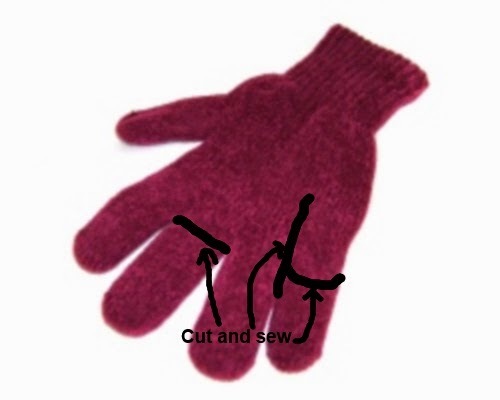 For a little extra sewing but a more accurate anatomy, cut between the ring finger and the pinkie finger until it is even with where the thumb begins and then sew that together to make a longer arm. You may need to trim the pinkie finger so it's the same length as the thumb and then sew the end up as well. Sew buttons on for eyes, then stuff the glove with stuffing. Sew up the top of the glove and you have a cat/creature! To add the sweater, you can make the pinkie into the arm in the same way. Cut off the tips of the thumb and pinkie, and them completely cut the other three fingers off. Stuff the piece of middle finger you cut off the original glove and sew it onto the back of the sweater to create a tail. Put the sweater on the cat and that's it!